The heart of Camp Asbury’s resident programming is the small group experience. 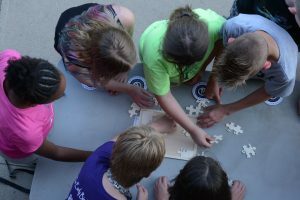 Campers in overnight programs participate in camp-wide weekly theme evening activities as a way to add spice to their week of camp and unify the entire camp. 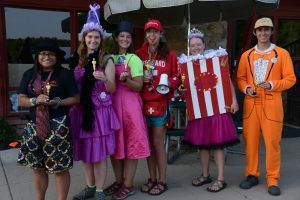 Day Campers do no participate in weekly themes. It’s game time! This week Camp Asbury will turn into a life-sized game board, and it’s your turn to play! Spend each day of camp doing all your favorite activities, and in the evenings get ready to roll the dice! Enjoy popular games from other countries in the world, play giant versions of your favorite games, and create a brand new game with your fellow campers! Get ready to shuffle up a week of fun! Grab a magnifying glass and put on your thinking cap! Camp Asbury is making you the prime detective in a week filled with mystery and intrigue! Learn how to decipher hidden messages and solve daily riddles. Hunt down the Asbury villain and save the camp! Find your way out of an escape room with your fellow campers! Are you ready to track down the clues and dust for fingerprints? Your mission, should you accept it, is…Operation Camp! Your favorite wizarding week is back! Step onto Platform 9 ¾ and board the Hogwarts Express for a fun-filled week at Camp Asbury! Bring home the triwizard cup, and watch a Harry Potter classic on Asbury’s big screen. Celebrate the 4th of July with a magical picnic and wizarding games! Try your hand at Quidditch and catch the golden snitch! What fantastic beasts will you uncover at Camp Asbury this week?! Roll out the red carpet—it’s time for a week at the movies! Join us on set as your favorite films come to life! See a movie premier at the hike-in theater and explore different movie genres. Strike a pose at Camp Asbury’s own awards ceremony, and take home the golden globe! Enjoy games and activities inspired by the big screen. Plus, take part in Camp Asbury’s first ever popcorn party!! Lights, camera, action! Let the camera roll on a great week of camp! Celebrate the night at Camp Asbury by the light of the full moon! This week we’re celebrating the 50th anniversary of the moon landing! Launch your own homemade rocket into the sky and peer into space through a telescope. Learn from a NASA scientist! Extended evening activities capture the wonder and beauty of night at Camp Asbury! It’s time for a stellar week of camp! Three, two, one, Lift Off! Everybody has a gift and talent. EXPRESS YOURSELF! Enjoy camp classics alongside activities centered on the arts. Learn from artists who create ceramics, music, photographs, and writing to express themselves. Choose a breakout session to hone a creative outlet that you identify with. Bring it all together by lifting your voice in Camp Asbury’s mass choir. This is your week to shine!